Frontend input field creation in "Submit location"
I am having small problem with "Submit location". In documentation example ( eventbookingdoc.joomservices.com/fronten...ment/submit-location ) there are several fields shown (Name, address, city, state, coordinates and publish). In Submit location menu item I see less fields (name, address, coordinates and publish). I want to add new field (text box), but I cannot find where and I cannot find where are other hidden fields (for example - state). Replied by Tuan Pham Ngoc on topic Frontend input field creation in "Submit location"
Replied by Viktoras on topic Frontend input field creation in "Submit location"
Project is similar to "world cleanup day". People can report exact location where they spotted trash and now client wants that people could report trash type (plastic, tires etc.). So fields would be (name, address, coordinates and trash type). I have just published those two modules and nothing happened. I prefer new field creation, but if it's not easy, at least I am willing to use existing fields for the same purpose. Last edit: 2 weeks 1 day ago by Viktoras. 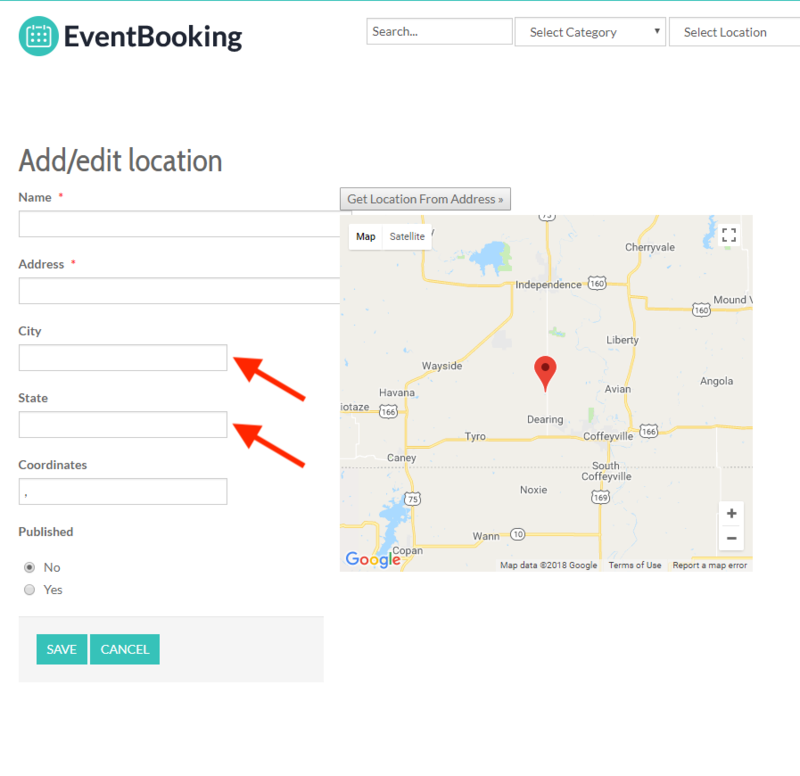 Replied by Richard Chick on topic Frontend input field creation in "Submit location"
I have just started using Events Booking and I was VERY disappointed to see that City and State have been removed as Venue input fields. I see at least two important reasons for having individual fields. First it is important for uninformed users to have an unambiguous place to enter that information (no need to follow the "suggested" formats. Secondly it places the information correctly in the location list forms. I cannot believe this has been done. I wish to avoid using Google maps as I am creating a non-profit site and I want to minimize costs if volume becomes high. Regarding autocomplete I was finding it to step on my input but I may have been using it incorrectly. I will try using the additional modules but I am trying to end up with a super-simple front-end user interface.